This was an orginal bore/orginal tire bike I purchased from the orginal owner. Super low hour bike was completely disassembled and gone through. All bearings, seals, and gaskets were changed in the bottom end, The cylinder was on standard bore and still had great compression, but decided to give it a fresh 1st over .025″ (see photo) Everything was either powdercoated, polished, painted…all hardware was re-zinced. Even though parts were in such great shape, it has lots of N.O.S. parts! I even took NOS spokes and had them polished….this thing gleams! Forks were gone through and new seals and N.O.S fork boots. Rear shocks still have great dampening. New brakes both front and rear. Just about everything rubber on the bike is brand new! Still has the very rare airbox cover! After 30+ years this beast came to life on the 2nd kick. Runs great and shifts smoothly through all gears. All new plastic. Geniune Suzuki number plates, vintage suzuki fenders and Wes at Enduro-Shack set me up with a brand new Clarke tank that I just had to have 5 time world champ Roger Decoster sign! 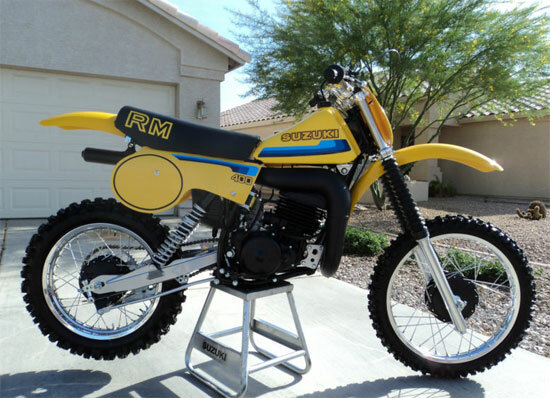 You will not find a nicer 1980 RM400T! This bike has a new title in my name I will have notorized along with a Bill of Sale…so International buyers are welcome…please check shipping rates. Bike is sold AS-IS and I will ask for a $500.00 deposit through Paypal within 24 hours of auctions end, and balance due in 7 days through a bank transfer or your more than welcome to pick it up. If you need more info or pics please ask. I travel to so. cal. quite often and could possibly deliver for a fee. I choose not to do paypal for entire amount due to the incredible fees. Buyer is responsible for shipping details.